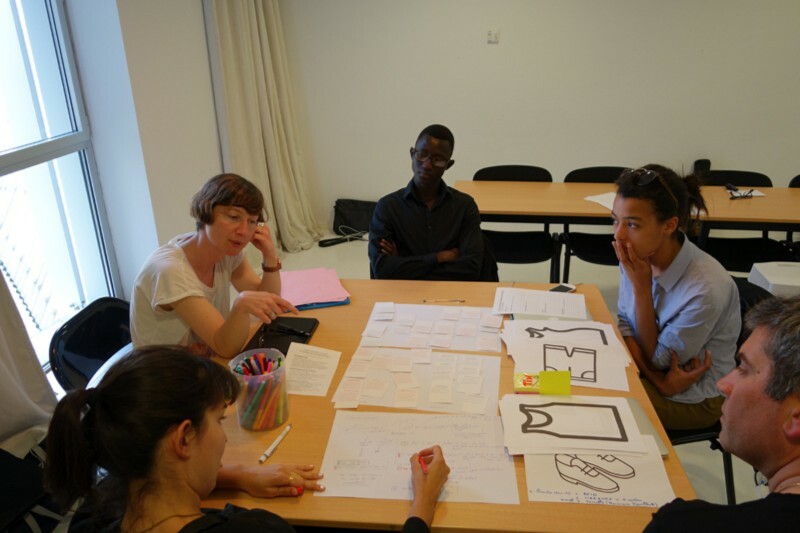 In May 2015, we led a workshop about “Critical Textiles” as a part of a cycle of events dedicated to smart textiles organised by Stereolux (Nantes, France). This participatory session was actually one of the pieces of our side project Disobedient Wearables, speculating on the broken promises and misuses of wearable technologies. We proposed participants to envisage a critical approach of smart textiles from the angle of social stakes directly and indirectly linked to this technological innovation. The workshop was an engaging occasion to dive into the grey areas of smart textiles and wearables in a possible near future: how current controversies would have vanished or become largely accepted? Which kind of mundane scenarios of life could be imagined? Among the friction points explored, several debates have been pointed out such as the inherent couple privacy/surveillance, the access to innovative products for everyone or the duality between assistance and dependence to technologies. As a common theme, these discussions were an opening to the notion of technological solutionism as coined by Evgeny Morozov, a stubborn belief in the capacity of technologies to solve social problems in an almost magic and automated way. 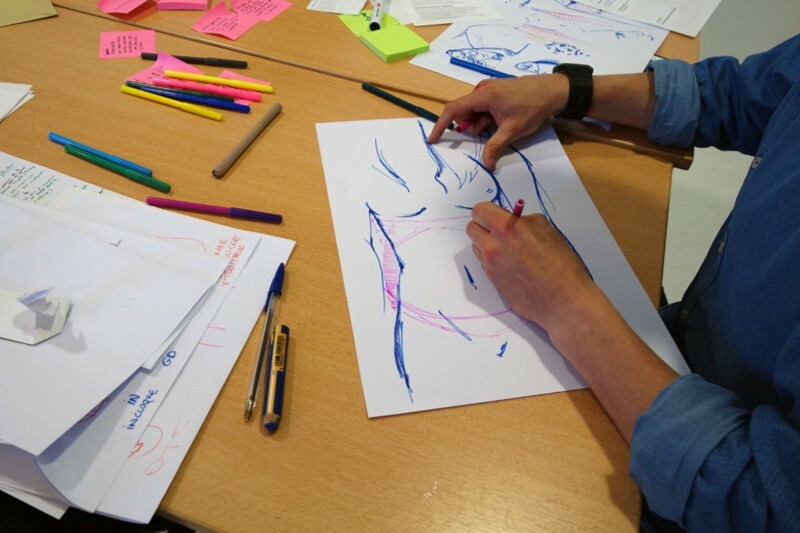 The atelier asked participants to adopt a singular posture, based on a speculative and critical design methodologies. They took on the challenge to envision the shift of the promises of smart textiles, carried by their promoters about the legitimacy of the technologies, towards deviant behaviours and insidious consequences. 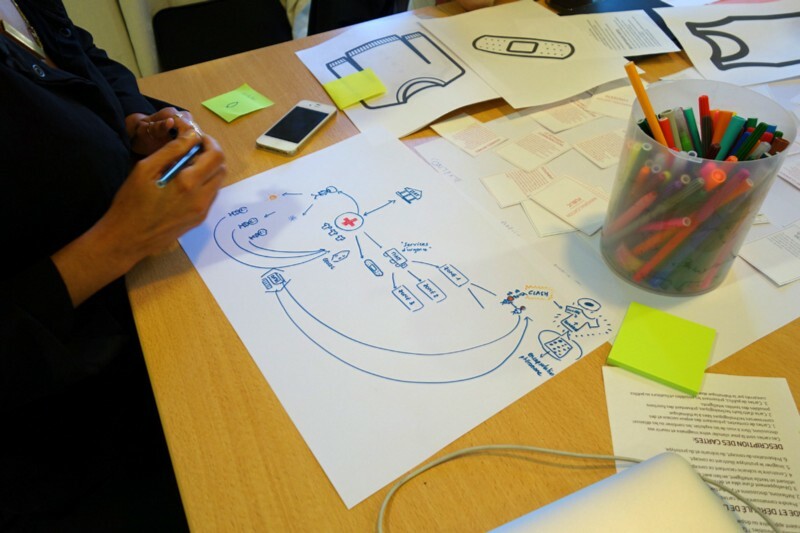 By extrapolating weak signals, the workshop has been articulated around the daily use of wearables wielding smart textiles, designed under the influence of new sociotechnological norms with their misappropriation and abuse. This approach consists in building tomorrow in order to think of what is already tacitly operating today. 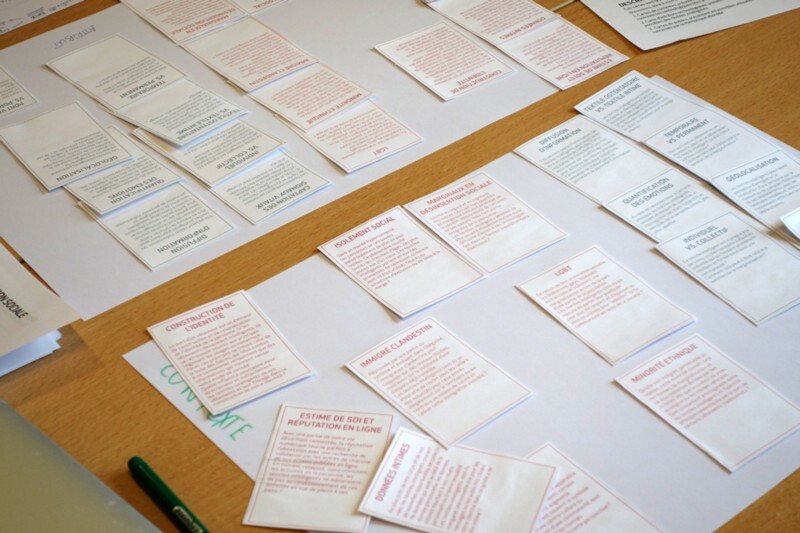 Assets for inspiration were provided to stimulate participants’ imagination with cards about technological possibilities, contexts in tension and omitted public. The given assignment was then to prototype critical objects questioning the ethical stakes linked to smart textiles through two societal issues: social marginalisation and precariat. Clothing has always had this social function, its new connected and smart nature won’t allow it to avoid the recurring questions about social conformity and marginalisation of its wearer. Which consequences, in terms of inclusion and exclusion, could have smart textiles and its wearables on marginalised or invisible public? Which forms of marginalisation could appear or disappear? These questions were starting points for exchanges about smart clothing and its connections with intimate data, identity building and the difference between loneliness and social isolation. Wearables linked to social marginalisation have been considered ostensible or hidden personal artefacts, sometimes forced to be worn. The social inclusion of several public, such as clandestine immigrants, LGBT community and ethnic minorities have been discussed under the clout of smart textiles. A first group has then designed a t-shirt with thermal regulation properties, adapting itself to seasons: heating its wearer during winter, refreshing him or her during summer. This cloth is targeting in the first place homeless people, as the goal of its promoters, public bodies ahead, is clear: make life in streets more bearable. However, this wearable embeds hidden features such as tracking vital signs from the person and her geolocation in real time. Ones would view it as policing homeless people when others would understand it as an efficient way to steer roams to individuals in distress. Additionally, the t-shirt is able to release microencapsulated relaxing pheromones to calm down its wearer and then to avoid street fights or behaviours judged deviant. The smart textile is becoming a means to handle the social behaviour of a vilified population. This critical product raises an interesting paradox as smart textiles are here, in the end, used to maintain the individual controlled in the streets rather than to help leaving them. The professional world is facing both mutations of employment with the fall of the wage system and the multiplication of mini-jobs. Consequently, it evolves with arising management techniques relying on data and sensors. 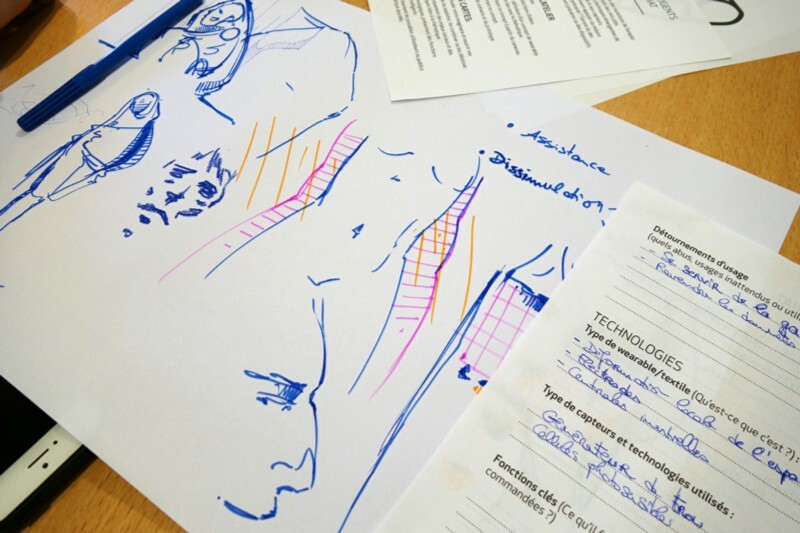 How smart textiles could support or reduce the emergence of new models of precariat? Would they be assistive tools for precarious workers or enslavement apparatuses? With inquiries about algorithmic hierarchy, human factors, lean management and the uberisation of work, participants envisaged several scenarios where smart textiles become new workwears. They reflected on how wearable technologies, by tracking and assisting the employee, could empower or coerce illegal workers or zero-hour contractors. The second group finally approached the question of precariat with pregnant workers striving in fields with a strong turnover; building on the case of a waitress. The smart workwear supplied by trade unions, offers to conceal the pregnancy from both manager’s and clients’ views. By subtly playing with the optical properties of the textile, based on the principle of an invisible cloak, the silhouette is then made slimmer. In order to make the illusion complete, the smart textile of the outfit works as an exoskeleton that offsets the weaknesses and limits of pregnant worker’s moves. The outfit also includes sensors functioning as a gestural memory and recording all the moves and know-how of the waitress. During her maternity leave, the latter could be transferred to her replacement by adjusting and correcting moves on the go, when it comes to carry a tray, for example. Doing so, the employer spares training periods of the new recruit. Between unsaid and deception, the scenario also considers hacking possibilities of the smart outfit in order to extract and then sell the recorded specific gestural know-how to competitors. We took from this workshop very interesting discussions about different perspectives outlying these social issues, ranging from a legal standpoint taken by a legal expert to commentaries from social workers. Participants took the challenge further the polished words from startups to reimagine the everydayness of not-so-desirable wearables. 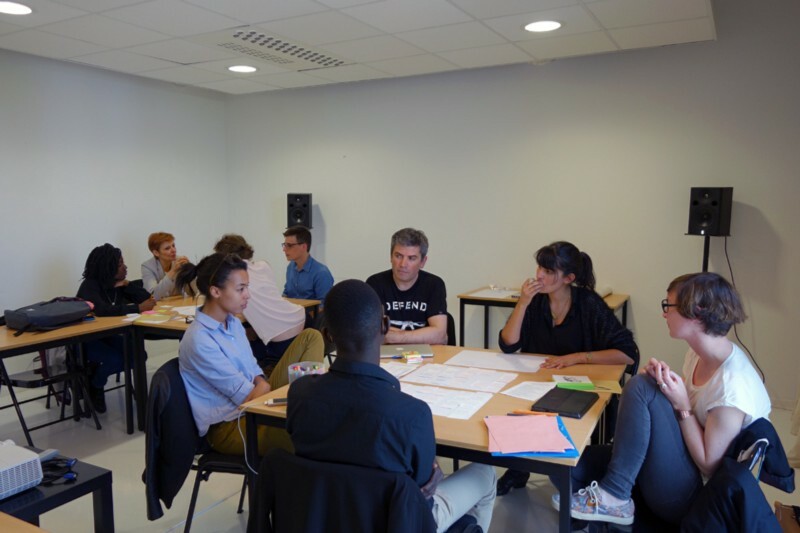 The workshop acted as a welcomed digression for participants to think about their role as creators or consumers of wearables as well as their possible choices regarding technology and its significance beyond what is visible and immediate. This article was first published on Medium in June 2015.